It’s nearly Valentine’s Day, and let’s gear up for the love-filled holiday with Lazy Oaf‘s latest capsule collection named “She’s No Angel“. 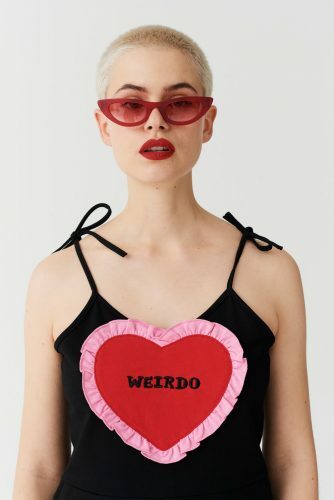 Debuting a new range of red, pink and black pieces, the label is focusing on quirky graphics and slogans like “weirdo” and “cold hearted”. The range features everything from cute T-shirt’s to furry slides, sporting the red, black and pink palette with devil details and heart graphics. Shop the pieces over at LazyOaf.com, take advantage of the free UK delivery for orders above £75 by sending your purchase back via Buyandship.